UPDATE: The blood vessels are slightly visible when you look at them with the naked eye, but nothing like viewing them in the infrared spectrum of light. As a quick update, Randi went to the hospital today for additional IV fluids and monitoring. The perinatalogist, unbeknownst to us, decided to come in and give Randi another Doppler ultrasound. Again, it appears that we bought ourselves a little more time. We are holding steady with Pooh being in consistent absent end diastolic flow. This is the second appointment that I have missed this entire pregnancy. The first appointment being the one in which we found out that we were having twins, although I was on conference call the entire time. So, as you can imagine I was a little bit more nervous about the phone call from Randi, because, as we all know, God loves streaks and He wouldn't want me to break a streak. Now on the lighter side, we recently made the purchase of a new camcorder for the arrival of our sons. One evening, I was trying out all the new features on the camera. 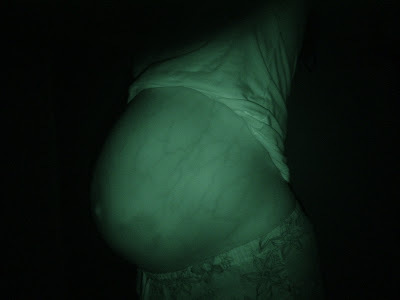 One feature, in particular, I was having the most fun with was the night-vision infrared lens. A guy would love that. I was taking pictures of the dogs and other things in the house, furniture, plants, etc. Randi had her shirt lifted to watch the babies moving. I turned the camera on her, and I just about lost it. She had no idea what I was freaking out about. I snapped a few shots of her belly (as seen below). It was one of the weirdest things I have ever seen. You can see all the blood vessels close to the surface of the skin, and you can also see the bruises near her belly button from the Lovenox shots she has to give herself twice a day to assist with blood flow. It should be noted that it is much to Randi's chagrin that I am posting this picture and the one above. For some reason, she thinks they are not very flattering. Randi, You look amazing! So fun to see you. That is an awesome picture. I am with Jen, explanation please!! Thank you for fulfilling my need to see Randi so far along!!! I check daily, and we look forward to each update. randi...you look fantastic! i actually think the 2nd photo is kinda cool! the body is such an amazing thing...pregnancy definitely shows us that. You look beautiful! 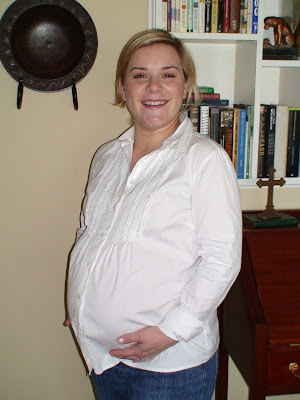 By the time I came over, the first picture was not able to be seen...I love to see pregnant mommy tummies! Before I read the post I thought you were going to say that those bruise spots were part of the babies! Now that would have been some great footage! Looks like good show and tell material for Pooh and Tigger in the coming years! !